What Parts of the Brain Are Impacted by PTSD? [Dr. Michael Roy] The memory parts—the hippocampus— kind of lower parts of the brain— are gonna tend to be activated because those are very strong memories. The amygdala is a part of the brain that we know in PTSD is often different. It works differently. It reacts more, and the amygdala goes way back to the days of the cavemen— escaping from the saber tooth tiger— so the fight or flight response. So people with PTSD tend to have greater reactions in that part of the brain than people who don't have it— even if they're exposed to the same sort of trauma. The frontal lobe—the front part of the brain is really important for emotions. So some of the withdrawal features of PTSD— the numbing, the avoidance kind of features— we think are more represented there, and we do see in those with PTSD characteristic differences there— that they tend to have lesser activations in those areas. From the frontal lobe (which houses our emotions) to the amygdala (which oversees our fight or flight response), Michael Roy, MD, Col. (Ret.) explains how parts of the brain are affected when injured by brain injury or a traumatic experience. See more video clips with Dr. Michael Roy. Posted on BrainLine May 24, 2013. 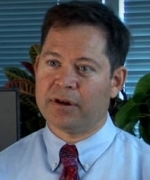 Michael Roy, MD, Col. (Ret.) is professor of Medicine and director of the Division of Military Internal Medicine at Uniformed Services University and director of Recruitment for USU's Center for Neuroscience and Regenerative Medicine. Produced by Victoria Tilney McDonough, Justin Rhodes, and Erica Queen, BrainLine. Can you have TBI from being a 81mm mortar gunner in Vietnam and it show up 44 years later as dementia along with PTSD?